With 43 entered athletes listed, black vests were sure to be noticed and so they were. Good team and individual performances, Luke Cotter's silver notable among the latter. The women's team packed brilliantly with Samantha Johnson running a storm and Rosie Edwards adding more class to a superb team, turning last year's silver to one better! 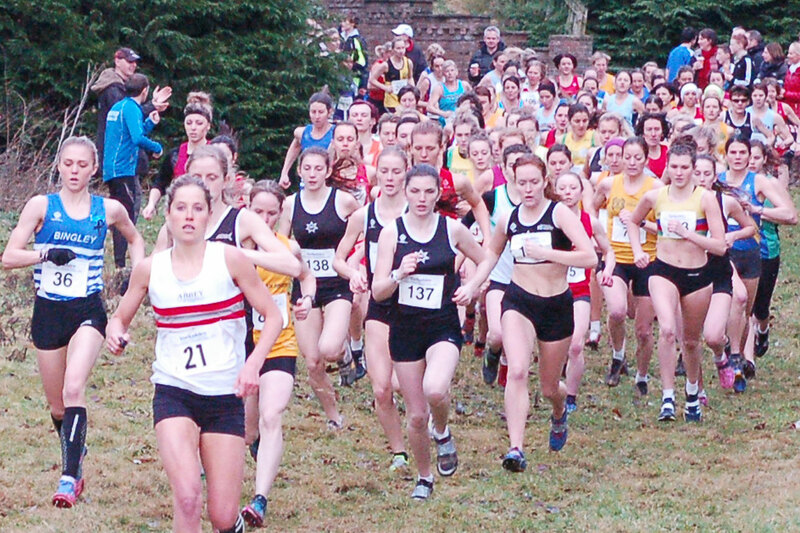 Lightwater Valley in North Yorkshire provided a picturesque backdrop for the Yorkshire County cross country championships, and a contingent of Rotherham Harriers went there with high hopes for the senior ladies team and competitive chances in many of the age group races. The strength in depth demonstrated by the senior ladies on the roads last year was once again in evidence with the A team wrapping up a convincing victory to improve on last year?s second place and win the county championship, and the B team securing fourth place in front of the A teams from some very strong clubs. Although no individual honours were won the A team of Sam Johnson (8th) , Jade Allen (9th), Annabelle Grady (10th) and Rosie Edwards (11th) packed particularly well and ended the day a full 21 points clear of Holmfirth in second and 33 points ahead of local rivals Hallamshire in third. The B team of Steph Burns (14th), Natasha Hatswell (27th and 4th Junior), Robyn Lancely (29th ) and Rebecca Middleton (31st) were close behind in 4th place and an incomplete C team of Janet Hindley (62nd) Emma Parkinson (64th and 9th Junior) and Gill Taylor (92nd) travelled to provide cover for any team member s taken ill or injured on the day. In the North of England Rotherham Harrier?s ladies section has established a reputation as the team to beat on the roads and across country in recent seasons winning honours at county, regional and national level. The best individual performance of the day went to highly promising junior Luke Cotter who took a silver medal for 2nd place in the U17 Men?s race and led his team ( Connor Ryan 21st, Aaron Thorpe 34th, and Robert Bentham 43rd) into 4th place overall in the team race. Keelan Wilsons 4th place in the U13 Boys race was also well backed up by team mates Declan Walker-Smith 9th, James Johnson 40th and Matthew Stevens 42nd to earn the team fourth place overall. The U13 Girls team (Mya Taylor 11th, Elle Carr 16th, Annabel Johnson 34th) was an agonising 1 point from gaining the bronze medal as they were touched off by Wakefield in the tightest finish of the day and they also had to settle for fourth place. Two teams of U17 Women were racing in Harriers colours and the A team ( Bonnie Smith 16th, Jess Freeman 18th , Mary Jenkinson 24th) secured 5th place in the team event with their own B team (Emma Dutton 25th, Jess Mangham 29th and Emily Hutchinson 31st)following them home in 6th place. In the senior men?s race 250 runners set off in the usual mad charge on the 10 km course. Phil Hoole was soon to the fore in a field containing World Triathlon champion and Olympic Bronze medallist Jonny Brownlee along with several other international class athletes. Eventually the pace of the top runners told and Phil had to settle for 12th place. Richard Harris ran a steady race to hold an excellent 20th place and with Aidan Johnson 54th, David Smith 76th, John Comrie 110th, Matthew Jones 172nd, the team finished a creditable 10th overall. Devon Stead (12th) and Sam Mason (55th) ran in the U15 Boys race but they did not have a third team member. Maisie Elliott (47th) ran as an individual in the U15 Girls race. The team performances were better than last year in almost every age group and three 4th places suggest that a significantly increased medal tally is achievable next year. This was a highly successful day for the club but there are the signs that it will get better each year for the foreseeable future.